I’m super lucky as a Wedding Photographer that I get to enjoy the best of the country and the city. Although really I’m a country girl at heart, some of my favourite weddings from the past couple of years have been city centre based. I’m often to be found photographing weddings in Manchester, Liverpool, Leeds and York. And I’ve learnt a number of things over the past few years about how city centre weddings differ and how to make the most out of them. Planning any wedding can be tricky – whatever the location, venue or size. This blog post is aimed at highlighting some of the potential issues you might encounter when planning your city centre wedding and hopefully help you avoid them! This is a biggie and one that is often overlooked by couples when they are planning a timeline for their city centre wedding. If your wedding day involves travelling from one place to another – home to church and then church to venue for example – make sure you’ve factored in enough time to get to where you need to be and still have enough time to enjoy your day. There’s nothing worse than spending hours sat in traffic when you want to enjoy time with your friends and family. City centre traffic can be a nightmare and can seriously affect the running of your day. Why not do a few trial runs on the same day of week as your wedding? If you think traffic might be an issue be sure to factor in extra time for travelling on your day. Cities tend to host lots of events. Sometimes they are planned months in advance – like Christmas Fairs or 10k races or sometimes they are very impromptu – like the recent protest marches. Make sure you check in advance if an event is happening in your city – it could mean road closures and extra traffic or it could mean that hotel rooms are being booked up in advance making it more difficult for your guests to find accommodation. It can even directly affect your venue – wanting to get married at Manchester Town Hall at Christmas for example? You won’t be able to use the main entrance whilst the Christmas Markets are happening. You’ll get to rock up to your venue in your lovely wedding car, get dropped off at the main entrance and be whisked away for champagne. Your guests on the other hand will have to find somewhere to park before they can come and join the fun. Most city centre wedding venues have little to no on site parking. Providing you guests with a handy map showing local car parks is one solution. Or perhaps you could consider arranging transport for everyone to get them to one place to the next? Fun and effective! 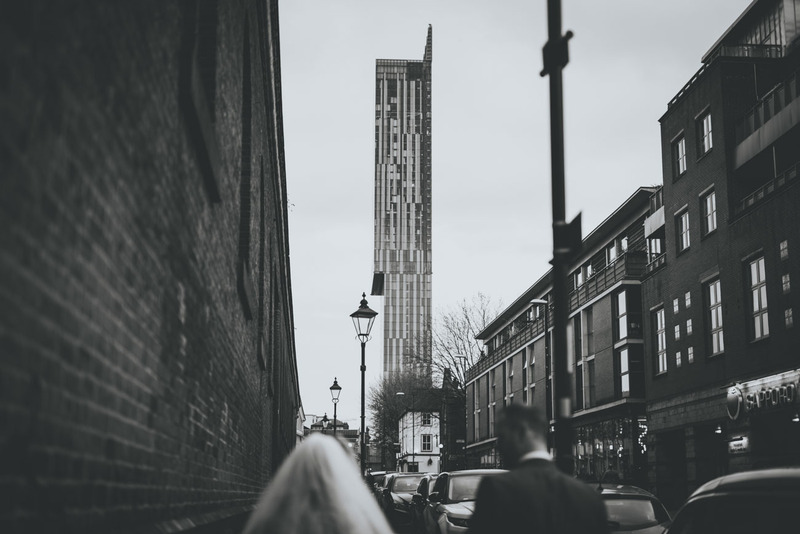 City centre weddings are exciting for us photographers – urban backdrops and gritty landscapes offer something completely different to green fields and rural surroundings. 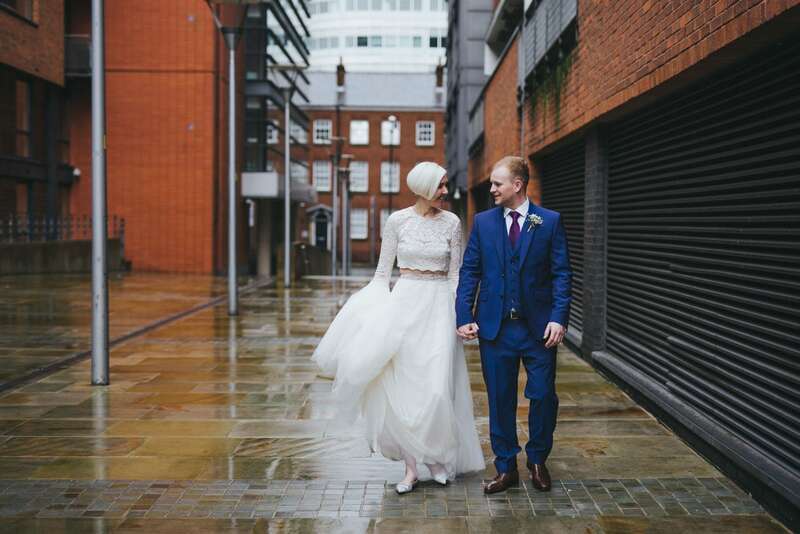 If you’re choosing a city centre wedding please make the most of it. The couples portraits are not usually an issue as a city centre can offer a massive variety of locations within a short distance of one another. Group shots however can be a whole other issue. City centre hotels often don’t have the same amount of outdoor space or grounds for pictures. Think carefully about what you’ve asked from your photographer and if there is a suitable location for it. 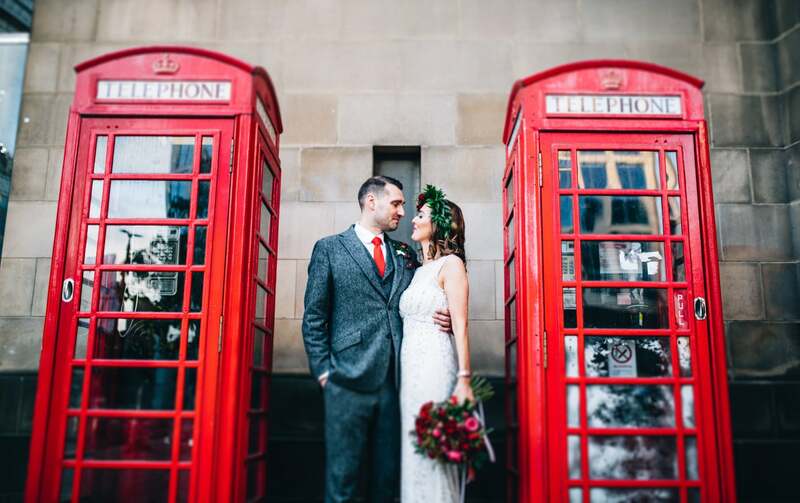 The biggest piece of advise I can give you if you’ve chosen a city centre wedding – is to just embrace it for all the wonderful opportunities it offers. Weddings have changed so much in the past few years – the array of venues available is amazing! Cool boutique hotels, chic little city centre bars, libraries, civic buildings and art galleries. You are so super lucky to be able to choose one of these incredible venues for your wedding day. Please embrace it – throw off tradition and let your imagination run wild! And most importantly of all – ENJOY!